The holidays are a great time to grow your creative tool, supply, and inspiration collection. At the Studio, I teach a lot of beginner sewing and knitting classes. One of the most common discussions after classes, as well as a focus during sewing classes in particular, is what tools do I need to pursue this at home. The other question I get a lot is what to buy for a child or how to teach a child who is interested in sewing or knitting. So, today I’m posting my Studio How-To guide to gifts for the beginner sewer. I’m not putting the luxury items here because they really aren’t necessary when you start or if you are an occasional sewer. Next week, I’ll post about shopping for the new knitter. Personally, I feel this list should be the same for an adult and child. I don’t believe in giving children craft tools designed specifically for them unless it’s an issue of properly fitting their hands or their feet reaching. Not because I don't like kids, but because I don't think kid tools are very good quality - they're designed more as toys that break easily. Most children aren’t very serious about pursuing sewing and knitting until 6-8 years old, and by then, they seem to be motivated to properly handle the tools and are capable of making very real projects, so real tools seem fitting. I strongly believe in teaching proper safety and operating practices from day one and letting children use real tools. Also, children will outgrow the child versions so fast, it’s not worth the investment to me. Sewing can be so much fun and really open up tons of creativity. You can make your own home decor items, personal accessories, clothes, toys, repair things, and more. Consider the type of sewing your gift recipient wants to do when you’re reviewing this list. Most of these items can be found at local stores (shopping local is always a great choice) and online. I have included links for your ease of research and shopping, but I have no direct affiliation with any of these. Sewing Machine - A machine is great, if you are ready for one and enjoy using one. At the Studio, we use Singer HD 4423 and the Janome Magnolia 7318. Both are manual machines (very user friendly, easy to troubleshoot, no computerized components), do basic stitches, buttonholes, handle a variety of fabrics, and are priced between $100 and $300. Either of these machines should cover your needs for several years or a lifetime. I don’t have a preference yet, but I’ll say the Singer is less expensive and can handle thicker fabrics (including light weight leather), but is slightly louder. Any new machine is practically silent compared to machines you may remember from your childhood though. I own an electronic machine for my personal sewing, but have to admit, I almost never use the bells and whistles that add to the price tag. Scissors - Get a pair that is sharp and intended for fabric. And use it only for fabric. Also, if you are left handed, please get yourself some left handed scissors. I have a lot of lefties in my family and I know the pain of not having scissors meant for you. Get a tiny pair of thread snippers (also good for seam ripping). We use Fiskars products at the Studio, which are widely available for sale at big box stores, craft stores and online. I love my Gingher thread snippers and they are handy for travel. Cutting Mat, Ruler & Rotary Cutter - I find a self healing mat (about 3’x2’ size), cutting ruler (a clear gridded ruler about 5” wide and 20” long), and a rotary cutter (a super sharp wheel used to cut fabric) indispensable for cutting any straight edges such as for home decor, bags, and quilts. If you’re going to sew clothes and dolls and other special cut items, this is not so useful for your work, and scissors are plenty. Rulers - I use a straight ruler (with my rotary cutter as mentioned above) and a tape measure. Pins - Pins are essential for some projects. As anyone taking my classes knows, I’m bad about using pins myself, but having them is essential at times. There are so many options and price points. In general, the price does matter and you’re getting a sharper point, sturdier pin, thinner pin, and less damaging pin by spending more. I have grown up using the cheap ones with the colorful plastic heads, but I hope to upgrade finally, after 20+ years of sewing. A few safety pins are also useful. Needles - You’ll need hand sewing and machine needles. Machines should come with at least a couple needles, but you can buy different kinds depending on the fabric you’ll use (denim, leather, jersey). For hand sewing, consider a variety pack with different lengths and sizes of eyes so you have something on hand for any project that comes up. You may also want embroidery needles if you want to use really thick thread or make decorative stitches by hand. Thread - I use a natural color (not bright white) thread for most projects. 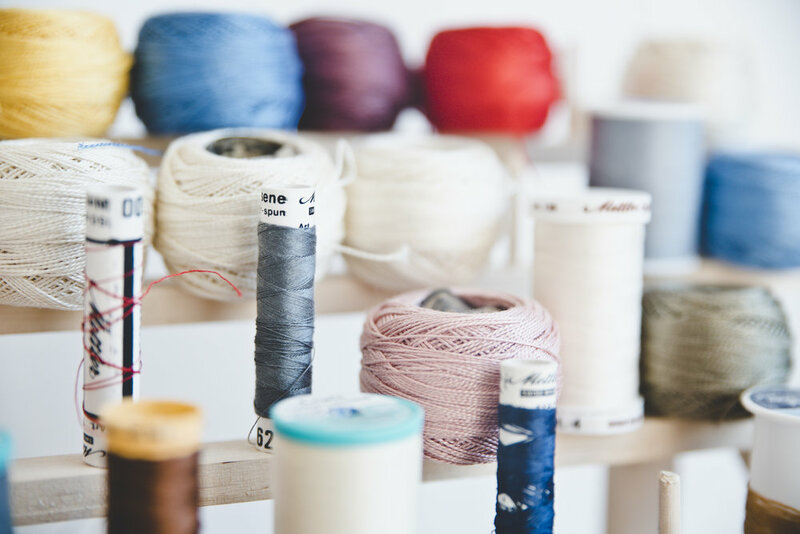 A few colors can be useful to have on hand, but depending on your plans, it may be better to just choose your colored thread as you need it so you can match colors better. For machine and hand stitching, an “all-purpose” labeled thread should work. I have been happy with Coats & Clark, Mettler, and Guterman brands. I recommend buying thread in person so you can choose color, weight and texture better. Fabric - Fabric is the exciting part (for me at least). If you know your recipient well, definitely buy her or him some fabric. For patchwork and small items, a bundle of fat quarters (fabric cut into quarter yard pieces a specific way) are really fun as gifts. For larger sewing, consider buying a yard or two of something fabulous. Beginners may want to stick with mid-weight woven fabrics (nothing too lightweight, slick or stretchy) and no knits (T-shirt material). If you’re not quite sure, consider gift certificates. This one is great in person because it's so hard to tell the quality, feel, weight, etc. when you shop online. Sewing Lessons - While lessons are not required, it is often easier to learn with a person in the same room to walk you through your work. That said, there are tons of great tutorials online as well, which are nice for the ability to start, stop, and replay. I like using both approaches personally. If your sewer would like lessons, we definitely offer classes for beginning sewing and for projects as you progress. We teach kids and adults, and we do custom classes for groups who want to learn together. Or, if you or your sewer get started on your own and then reach a wall where you just need a little help, come see us at the Studio and we can help you on your way. Hope this helps your holiday (or personal) planning. Happy shopping, and tune in next week for info on shopping for the new knitter.